Freed from jail, Anya hopes that things will get back to normal. But life on the outside is even more dangerous than life behind bars. Some of her gangland family want revenge for the crime for which she has done time: the shooting of her uncle. Forced to flee the country, Anya hides out in a cacao plantation in Mexico. There she learns the secrets of the chocolate trade, a trade that is illegal and deadly in her native New York. There too she discovers that seemingly random acts of violence carried out across the world have a single target: her family. As innocent bystanders get caught in the crossfire Anya must act fast and decisively to stop it, no matter what the danger to herself. 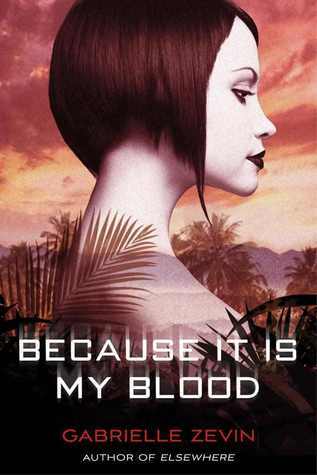 This is the second book in the Blood Ties trilogy, and before I start I’ll tell you that you really need to read the first one before you start this. Click here to read my review of All These Things I've Done. There’s nothing more really to be said about the world Zevin created, I’ve dealt with all of that in the first review. But in this one Zevin does go into more detail about why chocolate has been banned, which I really wanted to know. The whole chocolate prohibition is quite interesting and reflective of the world Anya lives in, but I won’t spoil it with the details. In this novel, Zevin continues to mock our present-day culture. All the grandparents in this book were born around the same time as me, so it’s weird to think that there will be a time after this when people will look at our culture and think that we were bonkers. There’s a beautiful Twilight reference that just blows a hole in our current obsession with vampires. Through this Zevin gives us a wonderful perspective on our culture, and I just hope she takes a shot at our growing fascination with dystopian fiction in her next book. There’s nothing like a bit of self parody, I always say. Just as I mentioned in the last review, the blurb on the back of my copy of this book is equally misleading. I’d like to ask the person who writes the blurbs why they can’t just put actual events from the plot on the back of the book. The one I found on Goodreads however was a better representation of plot, so I've used that instead. Finally to address the characters. Win is just as annoying as ever, ( especially at the end)but maybe because I’m not in love with him like Anya is I just find it more difficult to overlook his flaws. Gable continues to be a tool , and Scarlet turned into kind of a disappointment to both me and Anya because of a decision she makes towards the end of the book. Also mouse makes another appearance and grows quite a bit as a character, but there is still no mention of what she could have done to end up in Liberty ( which I really want to know so hopefully it will be in the next book). That’s really all to say about this book. I would definitely recommend it to anyone who enjoyed the first book. Zevin definitely keeps up momentum in this book and their are some interesting twists and turns that kept me engaged. I definitely want to read the next one if I can get my hands on a copy and find out what happens to Anya and co.